The National Energy Research Scientific Computing Center (NERSC) is the flagship scientific computing facility for the Office of Science in the U.S. Department of Energy and a world leader in accelerating scientific discovery through computation. 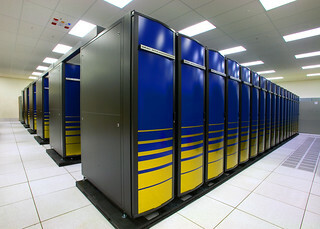 Cray XT4 supercomputer cluster (Franklin) has 9,660 compute nodes. Each node has quad-core AMD processors running at 2.3 GHz. Franklin has 38,640 processor cores available for scientific applications, with 8 GB of memory per node and a total 350 TB of usable disk space.